Pmod RS232 converts between digital logic voltage levels to RS232 voltage levels using the Maxim Integrated MAX3232 transceiver. The RS232 module is configured as a data communications equipment (DCE) device. It connects to data terminal equipment (DTE) devices, such as the serial port on a PC, using a straight-through cable. 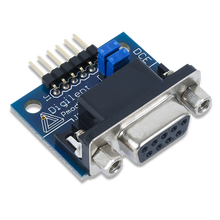 Related links to "Pmod RS232"